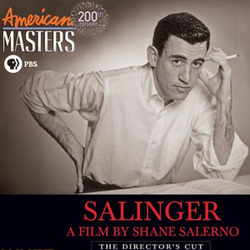 JD Salinger continues to seduce us from beyond the grave, thanks to PBS's American Masters television series. Out just in time for the anniversary of his passing, director and writer Shane Salerno, carefully crafts the life of a man who was a one-theme wonder, living in a world of the lovingly maladjusted Glass family. Salinger's brilliance wasn't so much his word play but his ability to tap into the vein of teenage angst and anger across generational lines, giving voice to an age and a never-ending franchise market. "Salinger" peels back a few layers into the very complex author's life, in an attempt to expose his motives for self-imposed exile, his method of dealing with his audience and his determination to keep his loved ones at a distance. What is fascinating about this superb documentary is not what it says about the artist, but what it reveals about the codependent relationship with his audience. Salinger's mania to keep his fans at arms length became translated into creating an audience obsessed with his alter-ego, Holden Caulfield, a main character of Salinger's focus. The documentary features a variety of his devotees and detractors, sharing opposing views of Salinger during his long life. It's interesting to note that the women who courageously exposed him - Joyce Maynard, Betty Eppes, teenager Shirley Blaney - were vilified for cracking the protective shell around Salinger and his self-created guru status. There's more footage wasted of breathless acolytes making the pilgrimage to his Cornish shrine, in what is otherwise a great viewing experience. The final part of Salinger hypes his post-death directives by a new era of Team Salingers, who are absolutely convinced that what the new millennia needs is more of the Glass family chronicles. Groan. Thankfully, J. D. Salinger forbid the cinematic world the rights to his classic, Catcher in the Rye - at least for my lifetime. It spares everyone - including myself - the countless hours in debate about *who* should play Holden Caulfield, now that Salinger's death has removed him from that position.